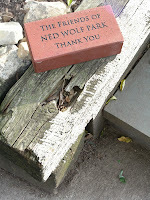 Friends of Ned Wolf Park: Buy a Brick! The Friends of Ned Wolf Park have created a great way for supporters to leave their mark in the park as we continue to raise funds for the Terrace Wall Project. 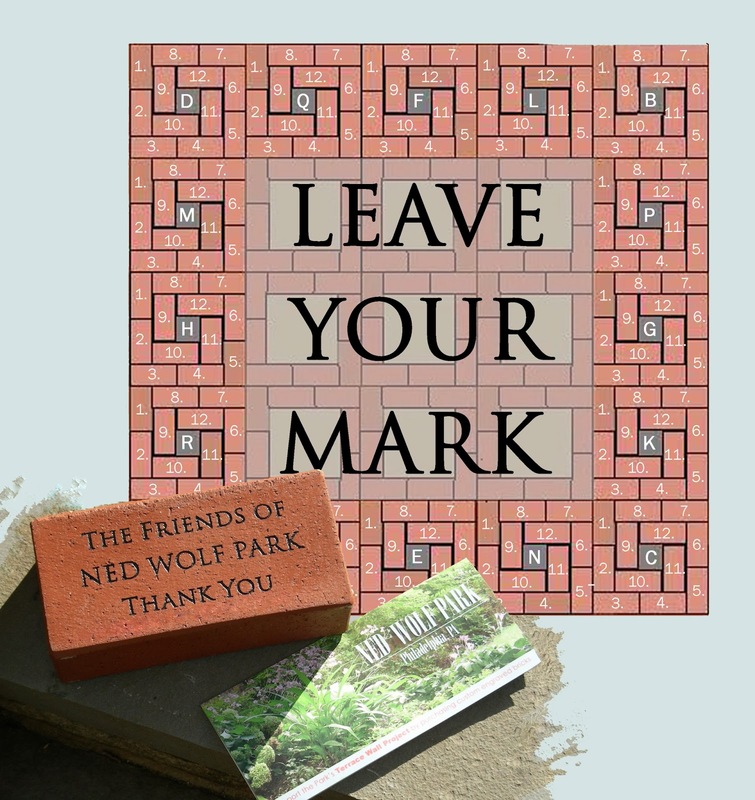 With your donation of $100 or more, we can offer you a custom engraved red clay brick [three lines of type with up to 20 characters per line] to be set into the park's paved terrace. But your donation will, more importantly, allow us to remove and replace the carcinogenic creosoted landscape ties that are decaying and shifting after 40 years. Once our fundraising goal is met, a new stone retaining wall, raised to bench height, will create a multipurpose gathering place at the heart of the park. The image above shows the pattern of the bricks that we will be replacing at the Terrace's center. 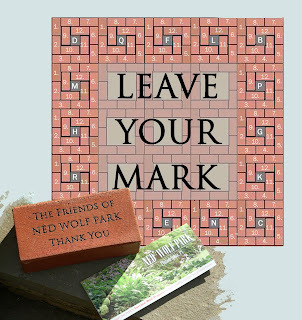 And with each 12 ordered, we'll engrave and install a block of these commemorative bricks so it won't be too long before you can visit your custom brick which will enrich the terrace and move us closer to the construction of a new stone wall. art exhibits or plant sales. We can more comfortably present talks about the plantings or facilitate the T'ai Chi classes or any number of new potential uses for our park once a group can simply sit down and engage together. There are only 192 bricks available, so we hope you reserve one now. Just pick up a brochure from one of the park's information boxes. 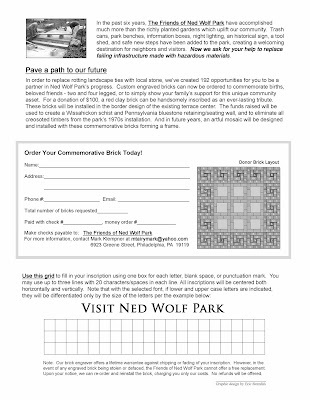 You can then fill out the order form with your inscription, enclose your check payable to "The Friends of Ned Wolf Park," seal the edges, add a stamp and mail it. 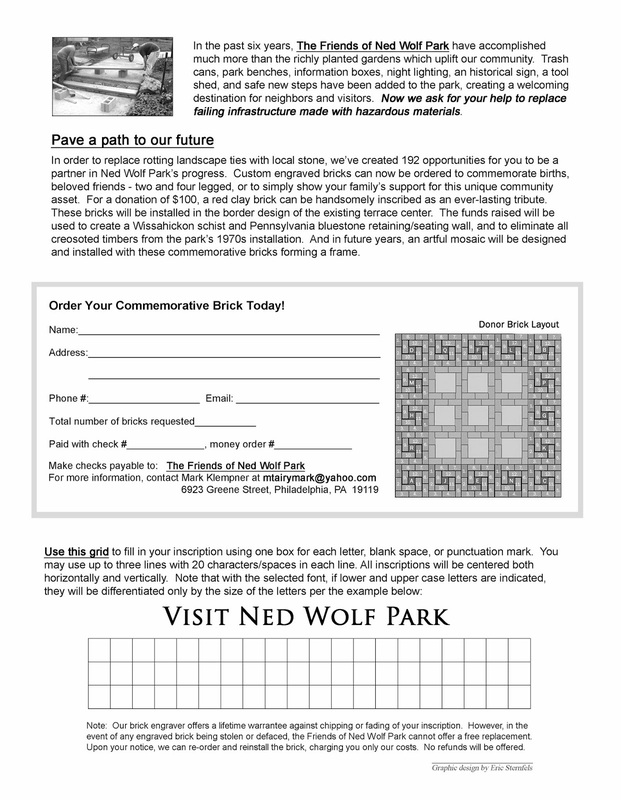 These personally engraved bricks would make a great holiday gift alternative that will be visible for generations. And your community contribution will be well spent, long remembered, and much appreciated! You can use a credit card to pay for your brick by clicking the "DONATE" button at the top of the righthand margin of this blog.